OPERATING IN 35 COUNTRIES, Nando’s is an international restaurant chain that originated in South Africa, known for its Portuguese-style flame grilled chicken and welcoming hospitality. Drawing cues from Mozambican/Portuguese culture, the Oshawa, Ont., location combines earthy textures, rich warm colours and whimsical design elements with a hand-crafted appeal. 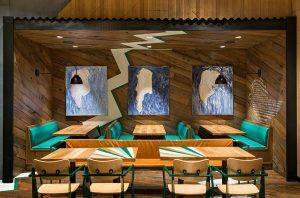 According to Keith Rushbrook, partner at Toronto, Ont.-based design studio IIBYIV Design, commissioned for the restaurant, the chain has “a really strong brand guideline book that still allows a lot of leeway especially with the South African Portuguese mix. “Which as designers offers a very strong colour palette, textures, materials, finishes and, patterns.” Warm colours help take the edge off of cold Canadian winters for diners, he adds. A conical, coffered wood ceiling defines the main dining area and dramatically frames a grouping of oversized woven pendants. 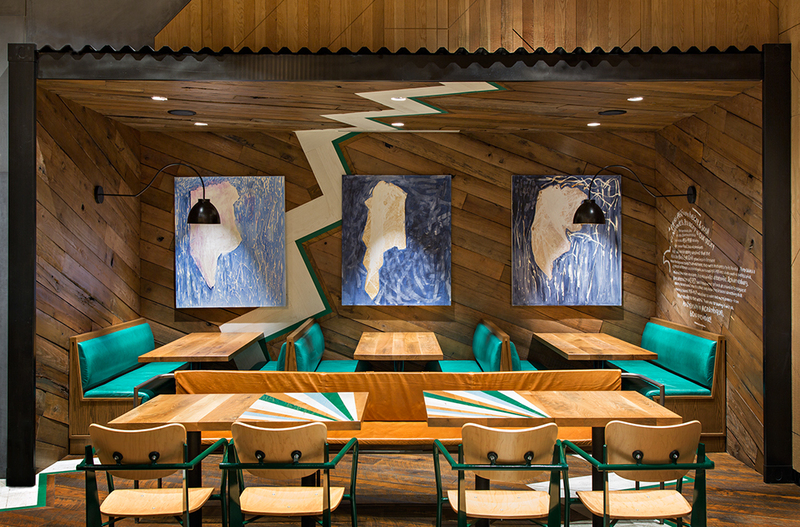 Painted table tops feature bursts of colour, South African art adorns the walls and a playful zig-zag stripe runs across the floor, up the back of a shipping crate-inspired dining niche. Nando’s has a total of 3,400 sq. ft., offering 2,200 sq. ft. at the front of the house and 1,200 sq. ft. at the back of the house. 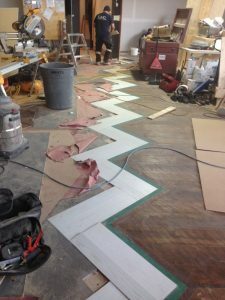 Flooring specifications include: polished concrete; natural oak wood flooring with natural hard wax oil pre-applied for protection with stained green and white inset zig zag effect; open areas of rustic oak with distressed surface, 7 in. wide solid planks; an accent of bleach white oak in 5 in. wide solid planks; and another accent of bleach painted green solid oak in 2 in. wide solid planks. When the oak is stained with the dark field stain, that exposes through the textured wood, according to Rushbrook. “In the seating area, we carry the wood floor right up to the walls and the ceiling as well. 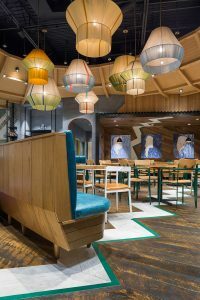 Happy enough that Rushbrook’s design studio is now one of the partners working with Nando’s in Canada, and will be creating other locations, adds Rushbrook.